The range of possibilities can seem bewildering, but it is this very flexibility which proves a huge attraction for investors, issuers and financial institutions. On the sell side companies issue these securities and corporate service departments advise on the type of options to include in them. On the buy side, investment managers seek to build portfolios with limited risk exposure using these securities and hedge funds utilize arbitrage opportunities between the convertible bond and the common share. The opportunities are endless but the seemingly labyrinthine complexities can prove daunting. 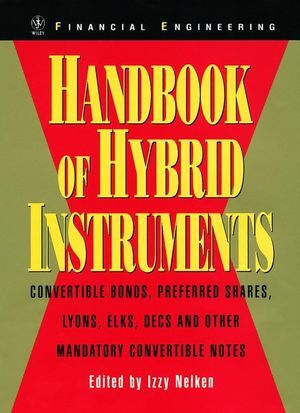 The Handbook of Hybrid Instruments helps steer a clear path through the maze. Izzy Nelken has drawn together a team of experts to provide in-depth analysis of many o key issues that both sellers and buyers require in order to operate effectively and profitably. A general introduction is followed by specific information on key clauses and variations, valuation methods, the impact on a firm's value following the public issuance of convertibles, details on when an issuer should call a convertible and the impact of these provisions on the price, the difficult requirement of input data to make sense of the models, indexes and reset convertibles. Finally, a highly useful glossary is provided of all the key terms used in this field. An analytical CD is also provided with the book, containing sample software of ConvB++. This combines complex state of the art models with a simple, user-friendly interface to assess fair values prices and to hedge parameters of hybrid instruments. 1.2 What is a Convertible Bond? 3.3 When should Warrants and Convertibles be Called? 3.4 What Happens to Firm Value when Firm Force Conversion or Exercise?